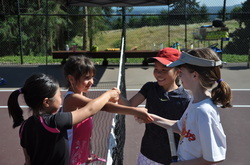 SUMMER: lesson groups start June 17 and end Aug 24 Saturday with a singles & doubles tournament. Jr. Summer Team League starts June 18th, 6:30pm. Call Jim at (503) 658-3830 to sign up. PAYMENT POLICY: Make all payments in full at beginning of each month. No rebate for a missed class unless you know at beginning of the month you will be gone for 2 or more weeks. Jim checks grips while assistant, Nick Goin, stands by ready to run the next drill. Nick played top doubles for Barlow High School and was on the east divisional high school championship team in 2009. He recently graduated from the Los Angeles Institute of Music as a guitar specialist. Nick learned how to play the guitar with his dad who played in a touring band. 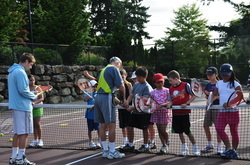 Six mini-matches being played during a short court tournament for ages 9-11 on a beautiful summer day. John, Linda, Glen, Duane, Polly, Tracey, Bev & Gene. Gene is 82 and one of our top senior players. His kids are improving and his 2 granddaughters recently won tournaments trophies in 2012. As of 2008 to the present, Tennis is again the fastest growing sport in America, as it was in the 60's and 70's. 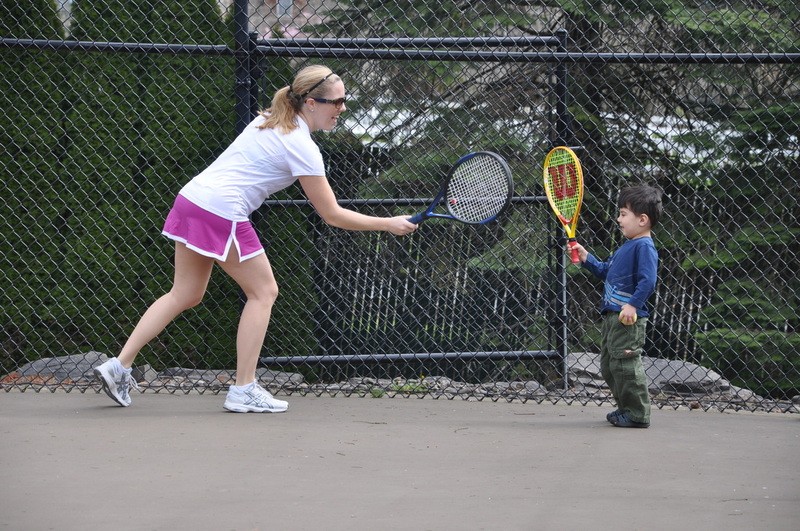 Adult lessons and USTA teams are increasing nation wide. Most indoor club memberships have a waiting list. Isn't it time you got in on the fun. To be added to an adult group below or to start your own, call Jim at (503) 658-3830. 1) USTA Competitive Teams - Class size: 4-6 players. 2) Mom's Lesson Groups - Class size is 6-8 players. currently have a child in Jim's program. 3) Mixed Doubles Adult Groups - $15/drop in. 10-11:15am - Intermediate Ladies. Limited to 4 players. junior program. Group size 6-8 players. 2-3:30pm - Intermediate 3.0 (male/female) $60/month. 3:30-5pm - Intermediate 3.0, (male/female) $60/month. Summer time at Jim's house. Jim conducts a one hour lesson to teach Moms and Dads how to play tennis together as a family so it will be fun, productive and bonding. Jim has seen too many parents make tennis time unproductive and unhappy. If done with wisdom it can create wonderful memories, and pull families hearts and spirits together. Cost is $60 with one or two (2) families sharing this lesson. This has been a highlight series that not only pulls each single family closer, but often brings the two families involved closer together. You can pick the other family before you sign up. Bring a picnic dinner to share. This is one smart mom who knows how to have fun with her son.